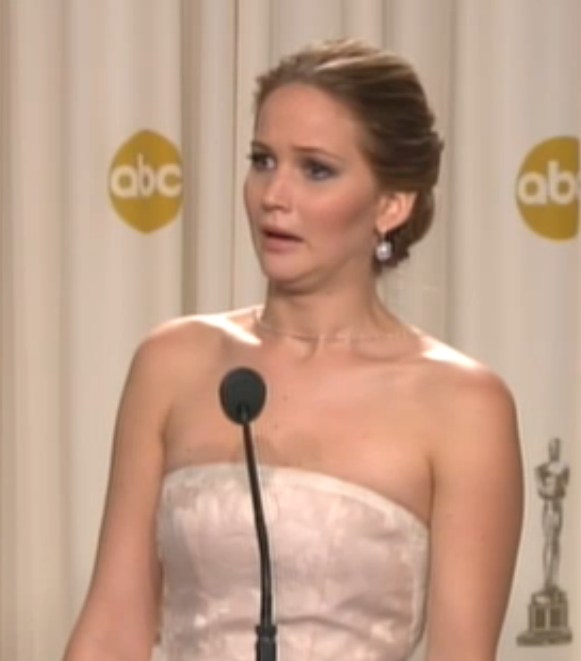 You probably have seen Jennifer Lawrence receive her Oscar for Best Actress. You probably also recall her tripping on her dress on the way up those stairs. The heels and the tremendous emotions of the moment certainly contributed. Many would have done similar. 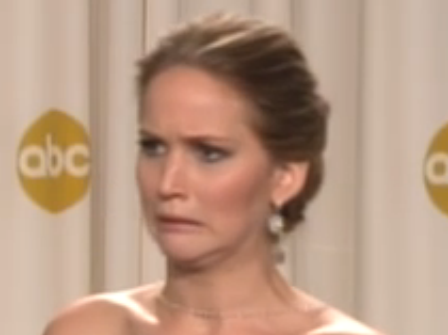 When a reporter asked the "Silver Linings Playbook" star, "... um ... The fall on the way up to the stage - was, was it a fall? What happened?" and Ms. Lawrence answered, "Was it on purpose? Absolutely. What do you mean what happened? Look at my dress! I tried to walk upstairs in this dress. That's what happened. I didn't actually ... yeah, I think I just stepped on the fabric and, and there wa..., they waxed the stairs." Just after she said, "...stairs". At the 1:26 mark, the "Hunger Games" heroine displays a rapid and evanescent thinning of her upper lip, a tightening of the tissue between the nose and upper lip (aka the "mustache area", regardless of gender), a dilation of both nostrils, along with a protrusion of her lower lip, an extended bilateral blink and looking down and away from the reporter. This cluster of nonverbal facial changes constitutes a microexpression of anger & disgust. Two questions later when another reporter says, "Here Jennifer, over here, here you go. Ah. At twenty-two years old you've got your first Oscar and you've already had two nominations, um, it's awfully young to have so much success so far. Do you feel, is it a good thing that it's coming so early in the career?" and Lawrence answers, "I hope so, yeah, I mean I ..., who knows? I guess we'll see!" The reporter retorts, "You don't worry about peaking too soon?" and she answers, "Well now I am! God!" From 2:04 to 2:22 she gives many nonverbal signals of fear. Some of these are encapsulated below. Of particular note is Ms. Lawrence's tightened lips/mouth corners which are pulled down and backwards (mouth of fear). Look at her neck as well - this classic "tenting" of the neck muscles - which is mild-to-moderately displayed here is known as the "neck of fear". Fear is the only emotion which causes this characteristic neck change. It also tends to "bunch up" the tissue beneath the jaw - and gives a temporary "double chin" appearance. 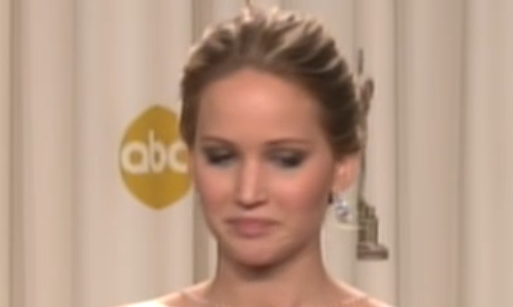 Jennifer's eyelids are opened wider than her normal. This image is slightly later in time than the one above. In the video you can see her take a small step backwards (2:09). In this still shot, Ms. Lawrence's leaning backwards is highly indicative of fear - although it also can be seen with disgust and contempt. As obvious as it may seem here, this body language goes largely unappreciated in the everyday world.